Hamad I Mohammed/Reuters; Middle East Monitor via Reuters; Matt Dunham – WPA Pool/Getty ImagesSaudi Crown Prince Mohammed bin Salman, the Saudi critic and journalist Jamal Khashoggi, and Turkish President Recep Tayyip Erdogan. The government’s official line has changed multiple times in the past few days. 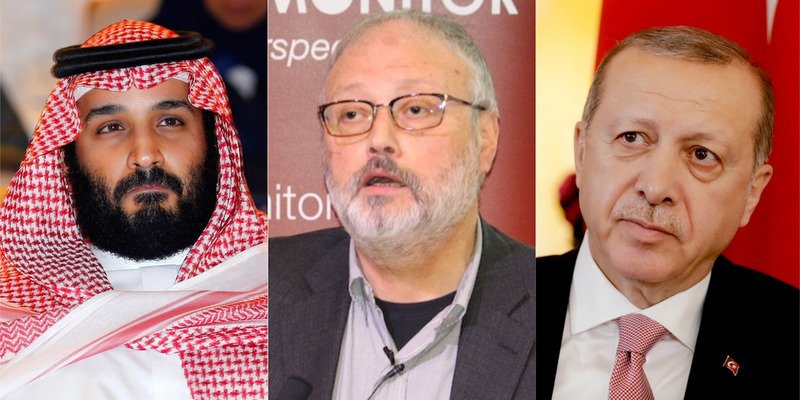 Experts have suggested that this happened: Turkey tried to coordinate its response to the case with Saudi Arabia, but the kingdom didn’t respond, so Turkey started leaking. Turkey’s response to the international crisis over Jamal Khashoggi, the Saudi critic and journalist who vanished after entering his country’s consulate in Istanbul last week, has been confusing at best. Anonymous Turkish authorities have also been leaking details of their investigation in dribs and drabs, casting increasing doubt on Saudi Arabia’s insistence of innocence. Experts said that the leaks appeared to be taking place because Turkey tried to coordinate efforts with Saudi Arabia to give it a way out of the crisis but the kingdom hasn’t cared enough to respond. On Tuesday, Sabah, a Turkish pro-government newspaper, published what it said were the identities and movements of 15 suspects who travelled from Saudi Arabia and arrived at Istanbul on October 2 – the day Khashoggi went missing – then returned to Riyadh that night. The newspaper did not say how it got hold of the names and whereabouts. Turkey’s Hurriyet newspaper also reported this week that surveillance-camera footage of the Saudi consulate in Istanbul had mysteriously disappeared. The government’s official line has also been changing. Over the weekend, The Washington Post quoted a person familiar with Turkey’s investigation as saying officials believed 15 Saudi agents carried out a “preplanned murder” and snuck Khashoggi’s body out of the consulate. Ankara is releasing more and more information about the case and casting increasing doubt on Riyadh’s insistence of innocence in Khashoggi’s disappearance. Khashoggi’s fiancée, Hatice Cengiz, has said she waited for Khashoggi outside the consulate for 11 hours and never saw him reappear. “When you piece together the threads of information that Turkish authorities have leaked and released, there is a story beginning to emerge,” he said. 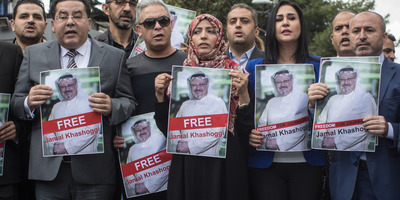 Chris McGrath/Getty ImagesProtesters hold photos of Khashoggi outside the Saudi consulate in Istanbul, where the journalist went before he disappeared on October 2. H.A. Hellyer, a nonresident senior fellow at the Atlantic Council and the Royal United Services Institute in London, said the leaks were “clear evidence” that Ankara had expectations that that Saudi Arabia would respond to the crisis, but the kingdom did not. “Ankara seems to be releasing information on the basis of expectations vis-à-vis Riyadh – and the leaks are clear evidence of that. “What expectations those are, on the other hand, remain unclear – but different reports indicate there are essentially negotiations underway between Ankara and Riyadh about how to move forward. Whatever happened to Khashoggi, one thing seems certain: His disappearance is a stark reminder of the kingdom’s brutal crackdown on dissent.